At the request of the lovely Zoe M., today is Otter Day! They are my favorite aquatic mammals. I'm very jealous of their eating habits- to survive some must eat 15% of their body weight every day (sea otters have to eat 20-25% of their body weight!). 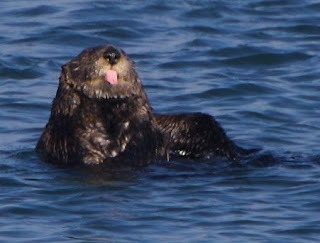 That means if I were like a sea otter, I'd have to eat 30-40 pounds of food a day! Mmmmm. (I guess that would get expensive though...) Most species of otters hunt for 3-5 hours a day; nursing mothers hunt for 8 hours. 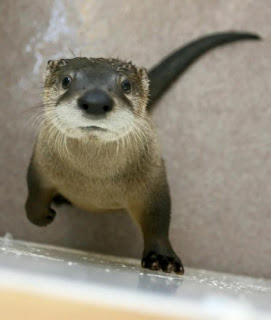 Check out the links section of Land of Cute- someone out there has created a Land of Cute otter-style. Enjoy! Don't forget, we still have one more day of random week! Send in your submissions! Otters are meant for Land of Cute! 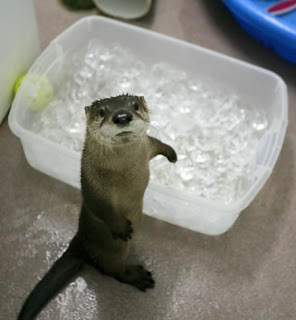 What a cute little Otter Pop, er, I mean Otter pup. I would like to be an otter and look like I'm playing and eating 20% of my body weight every day. I got bit by an otter once, they're not that cute. It's all about how to choose a proper partner who uses your funds in a right way - that is incorporate it in real deals, and shares the income with me.